We all know the story of Mulan, the badass Chinese heroine who disguises herself as a man to fight for her country. But if you thought her story was a thing of the past, think again, because someone got a good look at that old, sick orangutan holed up in the garage, and guess what: Turns out, it’s a lady orangutan! Wow. Talk about a Disney-worthy reveal! When the decrepit, grime-crusted orangutan first wheezed its way through the garage’s open window in a shower of grayed fur and skin flakes, everyone thought it was a male ape. After all, it did drag together a sad little nest of tarp and weatherproofing strips, cough up thick gray discharge onto the dusty floor, and use a tire iron to knock down that old paper wasp nest in a futile search for food. But just as Li Shang assumed Mulan was a man because of her fighting skills, everyone was shocked when, in attempting to fend off garage intruders with a pale thrown turd, the orangutan stayed still long enough to finally reveal its gnarled, dangling teats. Wow! This whole time, he’s been a she! If you’ve ever wished you could be a character in Mulan, going to the garage right now is as close as you’re going to get! Just like Mulan was able to fight better than the men alongside her, finding out that it was a woman orangutan who managed to brain an overly nosy raccoon with a well-flung trowel should make all of us question why we were so quick to assume it was a man. 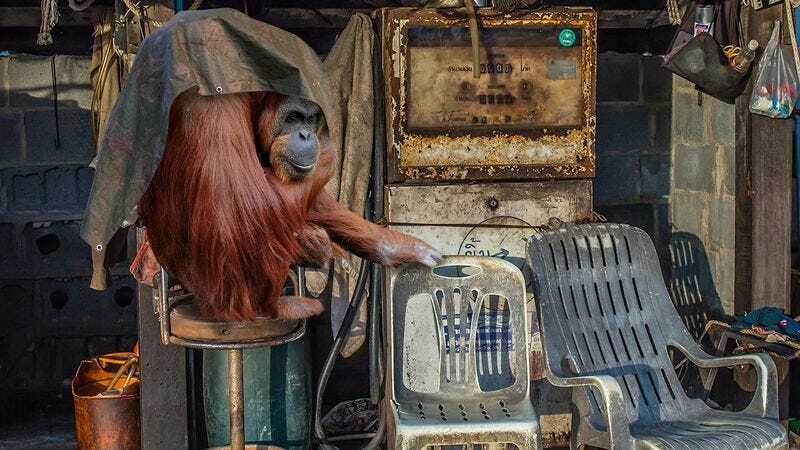 If a lady orangutan can be this old, this sick, and still fill the garage with as much sour, acrid musk as any male could, maybe she can teach us something about prejudice, too. It may not be as epic as Mulan defending China against the Huns, but this lady boss is not afraid to spray anyone who encroaches on her new home with a string of cloudy spit. And when animal control showed up in full force to collect what they thought was her corpse, she mustered enough jaw strength to break skin, forcing those invaders to beat a hasty retreat. Grab your notebook, because this carport princess just taught a master class in girl power! And as if we weren’t geeking out enough already, move over, Mushu, because she’s even got her own sidekick: a snarky-seeming little squirrel that lets her pick bugs out of its fur in exchange for licking the salt off her bald patches. With the emaciated orangutan’s breathing coming in little flutters every minute or so, it’s unclear how much time she has left on this earth, but for the time being, this dynamic duo is here to stay. Better stay out of the garage unless you want a double-barrel blast of womanhood! The garage will never be the same, because this modern-day Mulan is one for the storybooks. You go, girl.